Hong Kong, spine specialist Dr. Matty Wong shares an interesting story of a 40 year-old housewife with a sudden onset of face pain. Dr. Matty F.Y. Wong is a registered chiropractor in the USA and Hong Kong. She received her Doctor of Chiropractic Degree from National University of Health Sciences, Chicago, Illinois, USA in 1993. 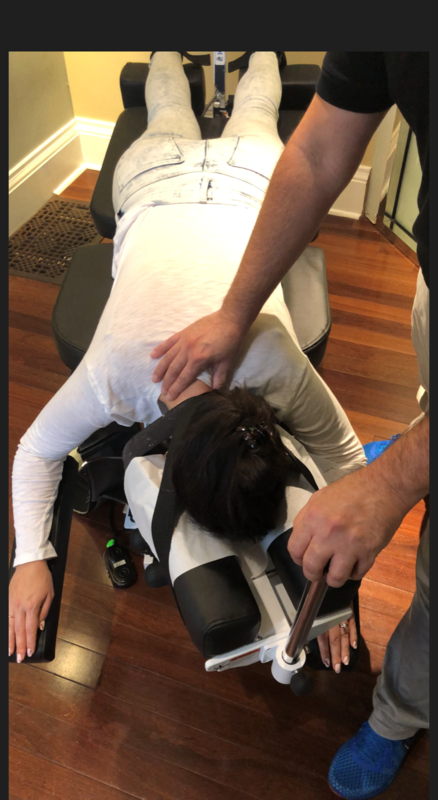 She undertook further certified program in Cox® Decompression Manipulation and brought this state of the art spinal care to Hong Kong as the first actively certified Cox® practitioner. Spine specialist, Dr. Kim Lombardy shares a story of a patient with hip and leg pain that still continues to have pain after her hip replacement. Dr. Kim Lombardy is a native of Sandusky, Ohio. 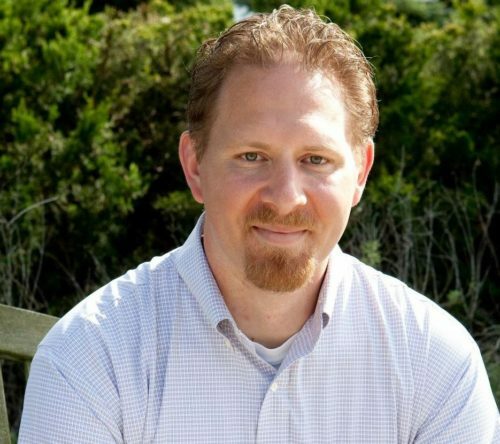 After suffering from chronic pain and illness, stemming from a childhood accident, and being under medical care for 20 years, he was referred to a local Sandusky chiropractor, Dr. Vince Darr. After a series of spinal adjustments, Dr. Lombardy’s pain began to recede, and his health was restored. He was so impressed that he changed his major from Pre-Veterinary Medicine to Pre-Chiropractic. After completing his undergraduate studies at Bowling Green State University, he enrolled in Sherman College of Chiropractic in Spartanburg, SC, where he graduated in 1980. Dr. Lombardy moved to Augusta, GA, and opened Woodland Chiropractic Life Center which later became Lombardy Chiropractic Clinic. He practiced for 29 years before being appointed Assistant Clinical Professor in the Orthopedic Department of the Medical College of Georgia, the first chiropractor to obtain that position in the history of MCG. After two years he returned to private practice. 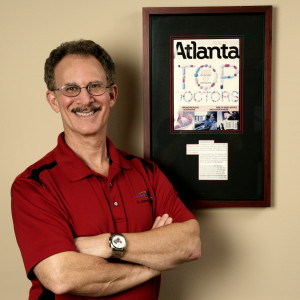 Dr. Lombardy served as Vice-President of the Georgia Chiropractic Association for three years. He has the highest level of training in Activator Methods (painless instrument adjusting) and Cox® Technic for disc problems. A certified nursing assistant suffers a severe neck injury as a result of an auto accident. Spine specialist, Dr. Jeremy Heidt and the patient tell her story of recovery using Cox® Technic. Dr. Heidt is Certified in Cox Decompression Adjustment and Manipulation Technic. This is a gentle technique used for treating many spinal conditions ranging from mild Low Back Pain to more severe cases of Back and Neck Pain such as Disc Herniations, Spinal Stenosis, along with many more conditions. Only 5-10% of chiropractors have completed the training to become certified in this technique. 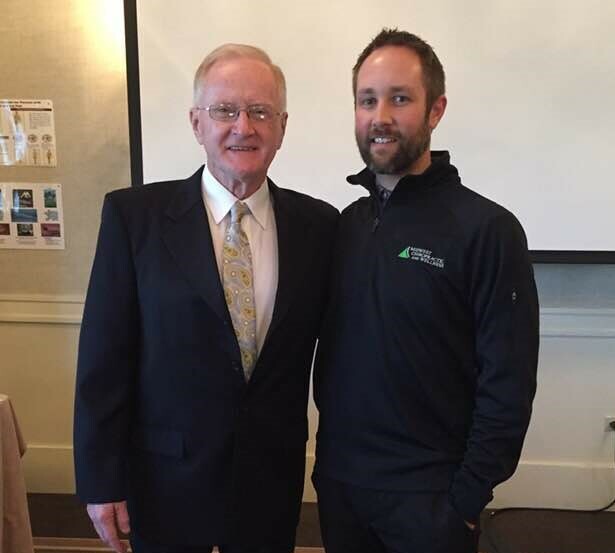 Dr. Jeremy has attended hands on training with certified doctors and most recently attended an Honor’s Seminar in Philadelphia with the goal of bringing his patient’s expert spinal care. Spinal Traction is effective in enhancing nutrition supply and promoting disc cell proliferation of the degraded disc. 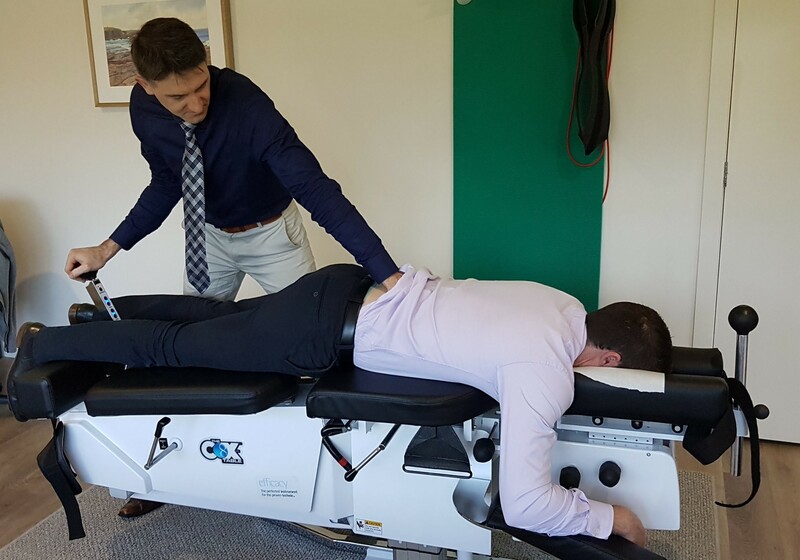 Australian spine specialist, Dr. Cameron McConville shares a story of a 67 year-old retired taxi driver with severe lower back and leg pain. Dr. McConville’s specialized treatment quickly returned this patient to his normal activities. Dr. McConville graduated from the RMIT Bachelor course in 1993. Following his graduation, he spent his first 5 years in Geelong. It was during that period that Cameron focused his learning on soft tissue disorders and their relationship with chronic spinal dysfunction. Muscle treatments and exercise rehabilitative therapy became a central focus of his treatments and he continues this unique approach today. Through ongoing professional education and training Dr. McConville has expanded his expertise and knowledge in the management of spinal disorders. Advances in the treatment of severe spinal cases led Cameron to the USA where he has undertaken further studies in the theory and application of Cox Technic. Dr. McConville is pleased to be one of just a handful of certified Cox practitioners in Australia. Certified Cox practitioners are regarded for their evidence-based approach to the management of spinal disorders. Dr. McConville has special interest in the management of sciatica, chronic low back, neck pain and headaches. A 56 year old runner experienced worsening back pain after a run. 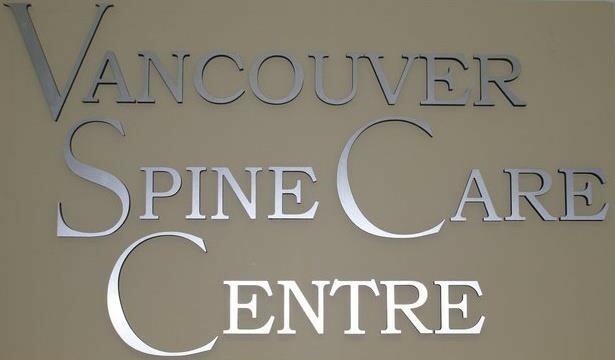 Spine specialist, Dr. Shawn Nelson explains the cause of his pain and his road to recovery. I have treated every type of patient possible from all 3 of my kids within 2 hours of their birth, to professional athletes, to motor vehicle injuries, to my oldest a fascinating 110 year old woman who was a burlesque dancer in Paris France in World War II. Given my own experiences in athletics, with my own significant injuries, I have a wealth of experience in treating all aspects of the spine. I also have a specialized technique for treatment of the shoulder. I employ over 10 techniques for adjusting the spine, and work tirelessly to find the technique that is right for each patient. I utilize a mechanically vitalistic view of the body. It is a beautiful machine that can do amazing things functionally, but only if it’s structure (the spine) is in its optimum condition. Toronto spine specialist, Dr. David Homer shares a story of a very painful neck condition called spasmodic torticollis or wry neck. All procedures performed by the Doctor. We do not use assistants. 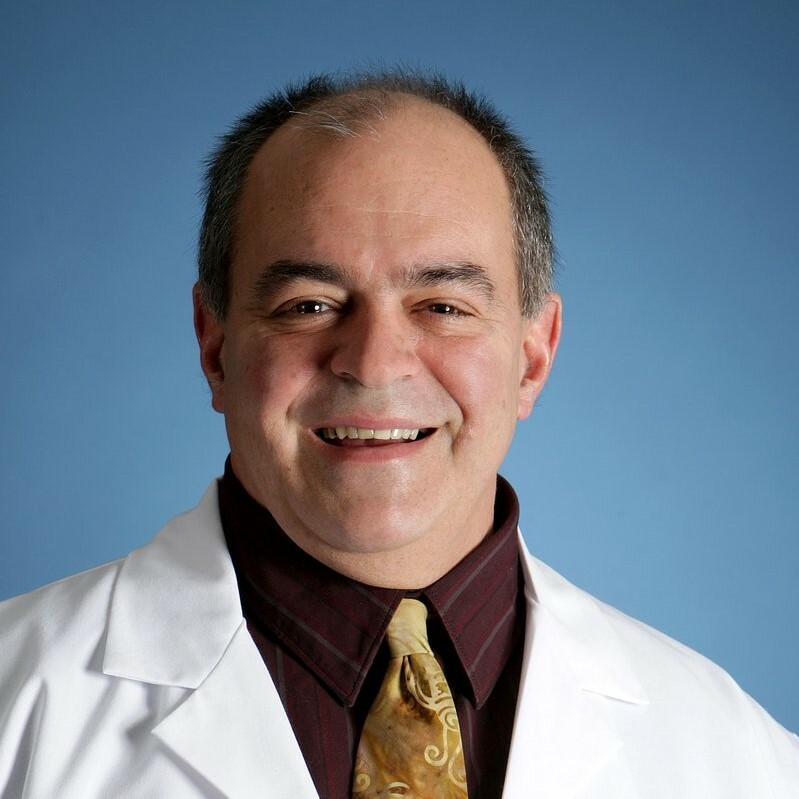 Spine specialist, Dr. David Atiyeh shares a story of a gentleman struggling to find answers for his perianal pain. Dr. Atiyeh at Atiyeh Chiropractic and Functional Neurology is committed to helping you regain and then maintain your quality of life, devoid of spine and extremity pain. He offers specific protocols for spinal pain relief that are well-researched, well-documented, repeatedly-published and clinically-effective: Cox Technic Flexion-Distraction and Decompression Adjusting Manipulation. The protocols were started 48 years ago by Dr. James M. Cox in Fort Wayne, Indiana. The Cox Technic protocols have evolved as clinical application demands and research studies dictate. We are proud to offer cutting-edge, 21st century, non-surgical spinal pain relief. Spine specialist, Dr. Dean Greenwood shares two stories of two different women both with neck and arm pain. Spine specialist, Dr. James Schantz shares a story of an owner of a landscaping business and his unusual cause of back pain. When the nation’s top chiropractic organizations teamed up with Prevention Magazine to honor six U.S. doctors with the Chiropractic Award of Excellence, they chose Dr. Schantz. He was selected to represent the pinnacle of community service and clinical excellence for the Southeast. Dr. Schantz has been twice honored by the Georgia Chiropractic Association as Humanitarian of the Year- a distinction shared with former President Jimmy Carter. Dr. Schantz volunteers his time with Flying Doctors of America, having performed chiropractic on medical missions to Peru, Guatemala, Vietnam and Cambodia. 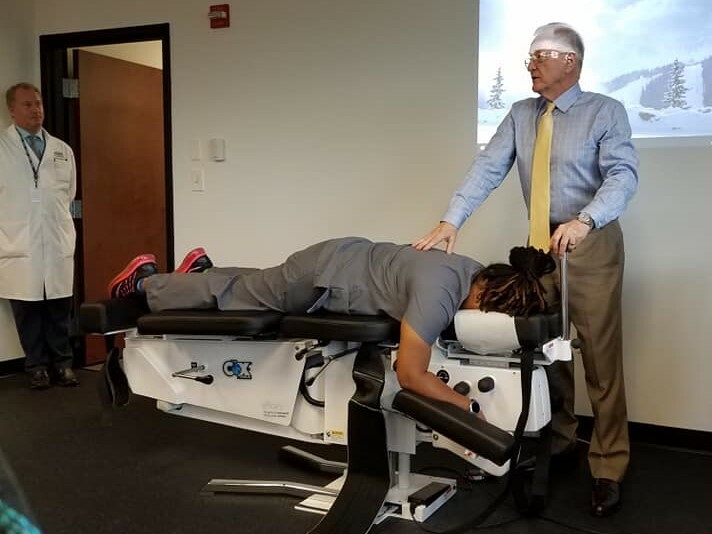 Dr. Schantz is one the few chiropractors in the State of Georgia Certified to treat patients using the Cox Technic Flexion-Distraction and Decompression protocols. This method is based on significant clinical research as well as clinical documentation. These protocols were started 48 years ago by Dr. James Cox. At our office, we are very proud to be offering this cutting-edge, non-surgical pain relief method. Dr. Schantz graduated with honors in 1986 from the nation’s leading chiropractic school, the National College of Chiropractic in Chicago. He has completed CEUs at Harvard Medical School in Low Back Pain, Sciatica, and Mind-Body Medicine. He is also Cox Technic Certified. Dr. Schantz has been a member of the American Chiropractic Association Sports Injuries and Fitness Council and the Federation of International Sport Chiropractors. He has trained as a Certified Golf Conditioning Expert. Dr. Schantz serves as an External Faculty Member for Life University School of Chiropractic, mentoring student interns. In his free time, Dr. Schantz enjoys rock climbing, kayaking, running, biking, yoga and volunteer work with his friends and family. Yokoyama K, Kawanishi M, Sugie A, Yamada M, Tanaka H, Ito Y, Kuroiwa T. [A Case of Subacute Combined Degeneration Caused by Vitamin B<sub>12</sub> Deficiency in a Cervical Spondylosis Surgery Referral]. No Shinkei Geka. 2016 Dec;44(12):1059-1063. Takasaki H1, Hall T, Jull G. Immediate and short-term effects of Mulligan’s mobilization with movement on knee pain and disability associated with knee osteoarthritis–a prospective case series. Physiother Theory Pract. 2013 Feb;29(2):87-95. doi: 10.3109/09593985.2012.702854. Epub 2012 Jul 30.